DENMARK: Siemens Wind Power has confirmed it will close its Engesvang blade site in west Denmark due to "significant changes in the global wind power market", affecting 430 jobs. The factory was acquired by Siemens in 2006 from LM Wind Power (then called LM Glasfiber) for €50 million. The manufacturer said the decision to close the site was partly because it could no longer produce the longer blades required in today's wind industry. "These changes include: sharply higher demand for bigger blades; more intense global competition and cost pressure; and the emergence of new markets. The Engesvang plant's infrastructure is limited to only produce small blades and cannot accommodate production of larger blades, including those necessary for offshore," a Siemens spokesman said. Siemens' factory is set to be closed by the end of July, with 430 jobs being lost. Siemens said it would assist the affected employees with "a range of initiatives" to be determined after negotiations with the unions. 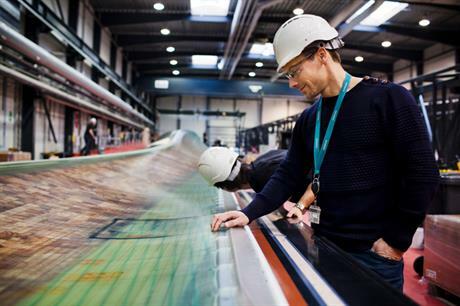 In late January, Siemens announced 150 jobs would need to be cut from its blade plant in Aalborg in February and April. "As a company, we need to adapt to all these changes in order to stay in the market and meet our stakeholders’ expectations, or we will be left behind. We remain strongly committed to Denmark, where our business was born and has very deep roots. Currently, we have more than 6,500 employees in the country," the spokesman added.